"contains 15 (sic.) tunes, with the Japanese text of the melodies written out in 萬葉假名 manyogana, a more elaborate style of the Japanese syllabary hiragana. For these tunes it appears that Gyokudo made conscious efforts to give the (qin) a more Japanese character....Some of these tunes are meant to be played by a duo of (qin) and the Japanese koto." "Fifteen tunes" suggests that Van Gulik saw only an edition of what is below outlined as "Volume 1". However, none of the pieces in this volume seems to include notation or tablature showing explicitly how to play with koto: I have not yet found any Volume 1 tablature that is not for qin. On the other hand, some of Gyokudo's glissandos do suggest a koto-type idiom, so perhaps Gyokudo's qin playing was influenced by koto technique. In this case perhaps "與箏合奏" suggested either playing qin like a koto, or meant that the tablature provided guidelines for playing a koto along with the qin. On the other hand, I do not know the source of that quote: perhaps it refers to pieces in the appendix, which do seem to have koto notation (some also have lyrics, though these are written only in the katakana syllabary). "Volume 1" of the handbook seems to have no table of contents, while the first part of the Appendix has what seems to be an inaccurate one. This has contributed to the likelihood that there are errors in my understanding of the contents. Recalling Ishu? Lyrics begin, "岐乃久尔乃於...."
"促 Soku" (poetic sequence? ); lyrics begin "䒨万(?)左安加也久女乃...." "促 Soku"; lyrics begin "安左美止利...."
"促 Soku"; lyrics begin, "爾之天良乃，爾之天良乃，於以"
"Kimpu" may also be romanized as "Kinfu". This handbook consists of qin songs and several essays attributed to Uragami Gyokudo (1745-1820), who therein referred to himself as "備前玉堂先生 Master Gyokudo of Bizen" (in Okayama). The title (sometimes shortened to 玉堂琴譜 Gyokudo Kimpu) generally refers to a printed handbook containing 15 (or 17?) pieces in one volume, but perhaps it originally had, or was intended to have, two volumes, the second volume now consisting only of two apparently incomplete hand-copied collections of a further 19 pieces (sample image), quite likely drafts intended for further editing. In this case the existing printed edition is Volume 1 while the second volume is called the Appendix. An electronic copy of Volume 1 on the website of the National Diet Library in Tokyo (q.v. ; scroll through 57 pages). Photocopies of the first 14 pieces in the hand-copied Appendix (further comment; sample image). Stephen Addiss, "Music for the Seven-String Ch'in", in Tall Mountains and Flowing Waters: The Arts of Uragami Gyokudo, pp. 29-48. (based on his doctoral dissertation, Uragami Gyokudo, the Complete Literati Artist. Ann Arbor, Michigan: University Microfilms, 1977). Van Gulik, "Uragami Gyokudō", in Lore, pp. 237-8 (quoted in full below). Yang, Yuanzheng 楊元錚, Japonifying the qin: the appropriation of Chinese qin music in Tokugawa Japan, 2008 (online [backup]). Various online catalogue references to Gyokudo's qin handbook, such as this one. Most references in Japanese and Chinese are beyond the current scope of this page. The image above is tablature from a webpage in Japanese that also has a recording of the melody. The handbook itself is available in several libraries, in several differing editions. I have not yet learned the full details of this, but an edition of Volume 1 is available online from the National Diet Library in Tokyo (q.v.). This image, its facsimile version, is clearly a different edition of the above. In contrast, whereas the tablature above and in the library link was clearly printed, the tablature here at right, from the appendix 玉堂琴譜後集 玉堂琴士著 (Gyokudo Kimpu Goshu, by Qin Master Gyokudo) is handcopied. The copy I have seen of the Appendix is incomplete and I do not as yet have further details on the relationship between the two. Its content is listed here. This is a tentative statement based mostly on the mode names and tunings observed. Van Gulik says that the lyrics are given pronunciation through a special script called manyogana, and Gyokudo apparently wrote of making his music intelligible to Japanese people. If the lyrics were intended to be sung using spoken Japanese (or something akin to it) then the number of syllables would be significantly more than the number of syllables for Sino-Japanese. Van Gulik gives a relevant quote about this, but the specific implications of this are not yet clear to me. The melodies as played today all being reconstructions from tablature, interpretation of rhythm is likely something to be debated, but as yet I have not seen studies of this aspect. There are general articles about Gyokudo in Wikipedia, Wikimedia, etc. For guqin references, specifically to Gyokudo's handbook(s) see above. As mentioned above, Gyokudo was a well-known Japanese painter and qin lover; melodies from his handbook have recently received some attention but few recorded performances. Van Gulik, op.cit., pp.237-9, has a long entry on Gyokudo. It is given here in full, but with characters from the footnotes put directly into the text, romanization modernized and his "lute" changed to "qin". 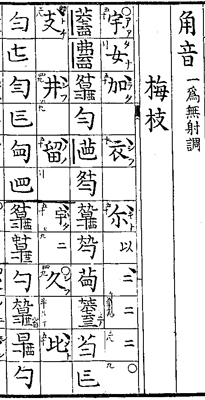 浦上玉堂 Uragami Gyokudō, 1745-1820, style 君輔 Kumpo, lit. names 玉堂 Gyokudō and 穆齋 Bokusai. A famous painter in the Chinese style from Kyoto. He was an enthusiastic performer on the Chinese qin, and was taught (in the Shin-Etsu tradition) by a direct disciple of 多紀藍溪 Taki Rankei (1732-1801). He published a handbook for the qin, entitled Gyokudo zōsho kimpu, in one vol., published in Kyoto in 1791. This contains fifteen (sic.) tunes, with the Japanese text of the melodies written out in 萬葉仮名 manyōgana, a more elaborate style of the Japanese syllabary hiragana. From these tunes it appears that Gyokudō made conscious efforts to give the Chinese qin a more Japanese character, for all of the tunes are purely Japanese. I cite titles such as 青柳 Aoyagi, 櫻人 Sakurabito, 伊勢海 Ise-no-umi, 梅枝 Umegae, etc. Some of these tunes are meant to be played by a duo of the Chinese qin and the Japanese koto ("與箏合奏"). After the prefaces this book gives some stray notes on the history of the Chinese qin in Japan; they are in dialogue form, and bear the title 答問八則 Tōmon hassoku. On leaf 7 of this section Gyokudō explains why he tried to adapt the Chinese qin to Japanese music. He says: 'Master Rankei... studied the qin under 廷賓 Taehin (i.e., 小野田東川 Onoda Tōsen [1684-1763]). Visiting Edo on an official mission, I met Master Rankei and asked him to teach me the qin. Later, however, I thought to myself: the words of the tunes taught by (someone who played melodies in the tradition of Shin-Etsu) are all pronounced in the Chinese way, so that people who hear these songs cannot understand them. Not understanding them they are not influenced by them. Not influencing the hearers, this music cannot be used for teaching them.' From an introductory note to this book, 玉堂琴記 Gyokudō kinki, it appears that the author obtained an old Chinese qin that was made by the Ming scholar 顧天宿 Gu Tiansu in the 寛文 Kambun period (1661-73); this qin was brought to Nagasaki, where it came into the hands of the Chinese interpreter 劉益賢 Liu Yixian. When Uragami finally obtained this instrument, which was called Reiwa (靈和 Ling He) and further bore the seal 玉堂清韵 Gyokudō-sein, he called his study after this qin, i.e., Gyokudō. Gyokudō was buried in the 本龍寺 Honnōji at Kyoto. When this temple burned down, his grave was replaced by a simple stone monument that is still to be seen today. On the two pillars the characters reiwa are engraved. Further, there still exists a stone tablet, erected in his honour on the place where he used to live, now the grounds of the 法輪寺 Hōrinji, in the outskirts of Kyoto. I visited this place in 1937, and made a rubbing of this inscription, written out by the famous Japanese scholar 賴山陽 Rai San'yō (1780-1832). The contemporary painted 橋本關雪 Hashimoto Kansetsu published in 1924 a magnificent volume with reporductins of Gyokudō's paintings, entitled 玉堂琴士遺墨集 Gyokudō kinshi iboku shū. It opens with a painting by Gyokudō's son, which represents the master with his beloved qin on his knees. To this book there is added a treatise called 浦上玉堂事考 Uragami Gyokudō jiko, where one will find full details about his life and his qin. Cf. also the publication Uragami Gyokudō, by 失野橋村 Yano Kyōson, one fol., Tokyo 1926. Among the illustrations there occurs a photograph of a qin made by Gyokudō himself in 1786, in imitation of a Chinese qin of the Tang dynasty made by a member of the 雷 Lei family, famous as qin builders. The brocade cover of this qin bears a lengthy inscription written by the well-known Japanese painter and sinologue 當岡鐵齋 Tomioka Tessai (1834-1924. The information given here about the songs is particularly significant within the context of syllabic settings: one could not simply take songs set for Chinese lyrics and sing them in Japanese because the Japanese would have a different word order and a different number of syllables. What is not clear, since I have as yet heard very little of songs played from Gyokudo's handbook, is what difference this would make to the musical idiom. 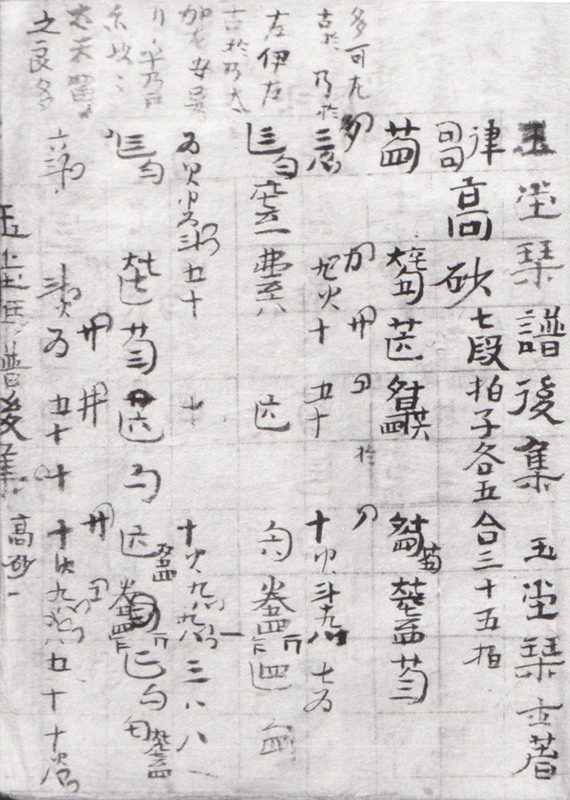 Many melodies in Gyokudo's handbook were "(讚歧)張元徽琴翁挍 corrected by the Old Man of the Qin, Master Zhang Yuanhui (of Sanuki [Shikoku])". "琴翁 Old Man of the Qin" was a style name of the painter 長町竹石 Nagamachi Chikuseki (1757-1806) of Sanuki; names he is said to have used also include 張 and 徽 as well as 竹石. In addition, he was known to be a friend and qin student of Gyokudo, so this must be the same person. Saibara were connected to the Japanese court music tradition (gagaku) but were thought to have originated in Japanese traditional music rather than from Chinese sources. To outside ears the music sounds very similar to gagaku considered to be of Chinese origin. It is not clear to me to what extent Gyokudo might have considered saibara melodies to be more local Japanese or more Japanese derived from Chinese. 10. Stephen Addiss, "Music for the Seven-String Ch'in"
The reviews by Paul Berry (in JSTOR) and Fred Lieberman (also JSTOR) mention an associated cassette called "Gyokudo's Music for the Ch'in"; the cassette, which had two recordings, is no longer available, but one of the recordings, the piece called Hito, is currently online here. Yang lists all of Gyokudo's qin melodies in a list of 165 titles he calls the "Gaku-kin repertoire" (pp. 234-255); he includes none of them in his list called "Tōkō Shinetsu's Repertoire"" (pp. 223-233; 62 titles). Since he seems to use the term 樂琴 "gaku-kin specifically for qin melodies either from or designed to go with the gagaku repertoire, presumably he considers all of Gyokudo's repertoire to fit into this category. Certainly they differ from melodies coming from the Shinetsu tradition, but I have not yet studied the argument saying Gyokudo was inspired by his knowledge of gagaku music. It is not clear why he and others say this has 15 pieces, when the actual list (and book) has 17, as can be seen above. Manuscript Fukuoka, private collection of Urakami family, "Gyokudō kinfu goshu" is a late eighteenth‐ to early nineteenth century autograph of Urakami Gyokudō, measuring 169×135 mm. and consisting of 28 folios. It contains the notation of fourteen gaku‐kin pieces. Manuscript Fukuoka, private collection of Urakami family, "Gyokudō kinfu" is a late eighteenth- to early nineteenth century autograph of Urakami Gyokudō, which contains the notation of five gaku‐kin pieces. The manuscripts of the Appendix are handcopies that in many places are barely legible. The lyrics are apparently all written in the katakana syllabary. 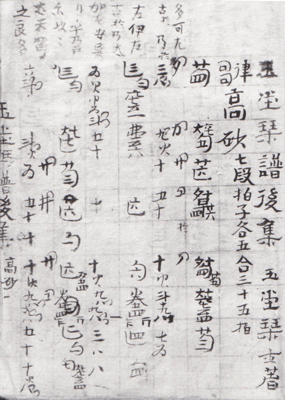 This list is from a page at the front of a photocopy that includes the melodies from GyokudōG. 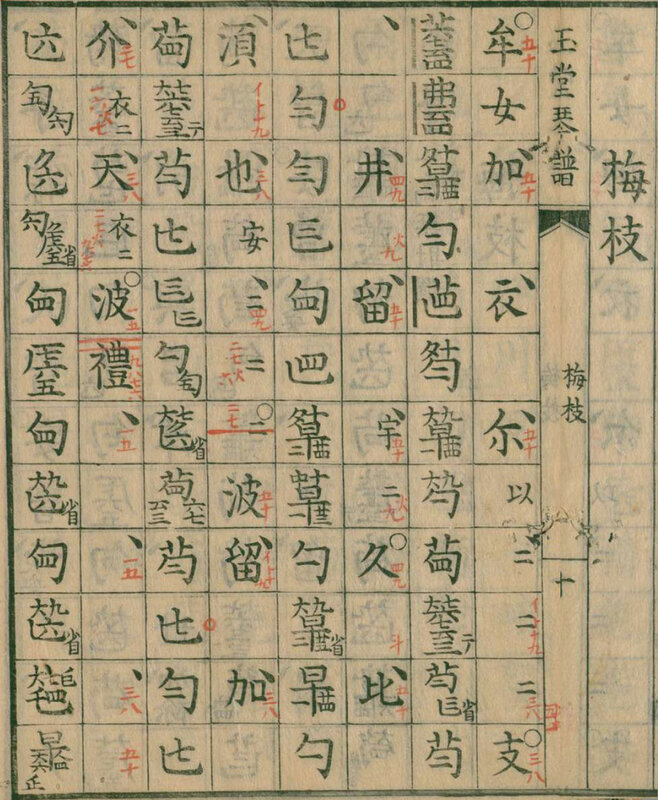 The 21 titles include all 14 from GyokudōG except #9 (but see #21?) but none from GyokudōD. Three are identifiable from Volume 1; four (or five) do not seem to be listed elsewhere. Manuscript Tōkyō, private collection of Kishibe Shigeo, "Kingaku zasshi" consists of two volumes. On folios 12r‐20r of the second volume, it offers different versions of the following gaku‐kin pieces: Etenraku, Goshōraku and Batō, prepared by Onoda Tōzen; Goshōraku, Bairo, Ōshōkun by Urakami Gyokudō; and Goshōraku, Etenraku by Murai Kinzai. The first two of the three have the same titles as #17 and #16 from the "Appendix"; I do not yet know whether their tablature is different.